Pamper your skin with the Shea Moisture 100% Virgin Coconut Oil Daily Hydration Body Lotion; a lightweight, quick-absorbing formula to soften and restore from top to toe. Combining exotic Acacia Senegal with all the best parts of the Coconut, the luxurious lotion melts effortlessly into skin to deliver long-lasting moisture and hydration, without greasy residue. 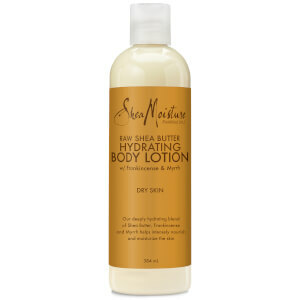 Skin feels velvety smooth and replenished after use. Water, Caprylic/Capric Triglyceride, Stearyl Alcohol, Glycerin (Vegetable), Butyrospermum Parkii (Shea) Butter*+, Glyceryl Stearate Citrate, Cetearyl Alcohol, Cetyl Alcohol, Cetrimonium Chloride, Glyceryl Caprylate, Cocos Nucifera (Coconut) Fruit Juice, Cola Acuminata Seed (Kola Nut) Extract, Acacia Senegal Gum Extract, Rosa Canina Fruit Oil, Vitis Vinifera (Grape) Seed Oil, Camellia Sinensis (Green Tea) Leaf Extract, Panthenol, Aloe Barbadensis Leaf Juice, Glyceryl Undecylenate, Fragrance (Essential Oil Blend) *Certified Organic Ingredient. +Fair Trade Ingredient.